We have been learning lots about planet earth in space over the last two weeks. We learned about the sun, moon and stars. We learned about the differences between day and night. We read some great books about these themes like “How to Catch a Star” by Oliver Jeffers, “Bringing Down the Moon” by Jonathan Emmet and “Can’t You Sleep Little Bear?” by Martin Waddell. 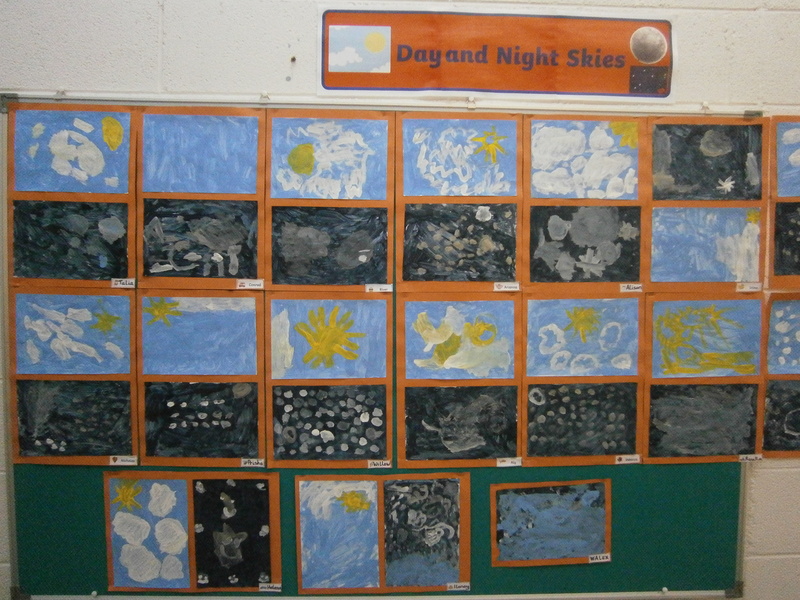 We made paintings of day skies and night skies to show the difference between the two. We also read a really funny book called “Aliens Love Underpants”! This inspired us to make our own spaceships out of recycled materials and aliens out of playdough. We had great fun exploring space during our morning activities. We had a Small World area where we played with toy rockets, spaceships, aliens and astronauts. We made spaceships and rockets in our Junk Art area. We made green playdough in class for our Playdough Area because we thought it would be a good colour for making aliens. We had a rocket ship Role Play area in our classroom and we even had some alien visitors! We also had a Construction area for making our own spacecrafts. We have really enjoyed exploring this theme and have shown wonderful imagination and creativity. Painting day and night skies. Our finished day and night skies.